Whether served piping hot in the middle of winter or ice cold on a hot summer day, tea can be a perfect drink at any time of year. Add probiotics — a bacteria that can aid in improving your overall health — to the mix and you have a drink that is not only delicious but also good for you. Probiotics, according to the World Health Organization and the Food and Agriculture Organization of the United Nations, are "live microorganisms, which, when administered in adequate amounts, confer a health benefit on the host." Probitoics are included in a number of foods to treat diarrhea, irritable bowel syndrome and urinary tract infections. Among these food products are milk and yogurt, as well as several types of teas. In teas, the probiotics may be brewed with the tea or added during the production process. Kombucha tea is a popular beverage in countries around the world. The tea is made by adding a colony of bacteria in the form of probiotics and yeast to a mix of green or back tea and sugar. The beverage is then allowed to mix and ferment before being served. The benefits associated with Kombucha tea, according to Dr. Brent A. Bauer of the Mayo Clinic, include aiding immune system function, improving digestion and improving liver function. There are adverse affects associated with Kombucha tea, and these, according to Bauer, include upset stomach and allergic reaction. Some forms of probiotics can be added to teas to aid in, according to the manufacturers, overall digestive health. 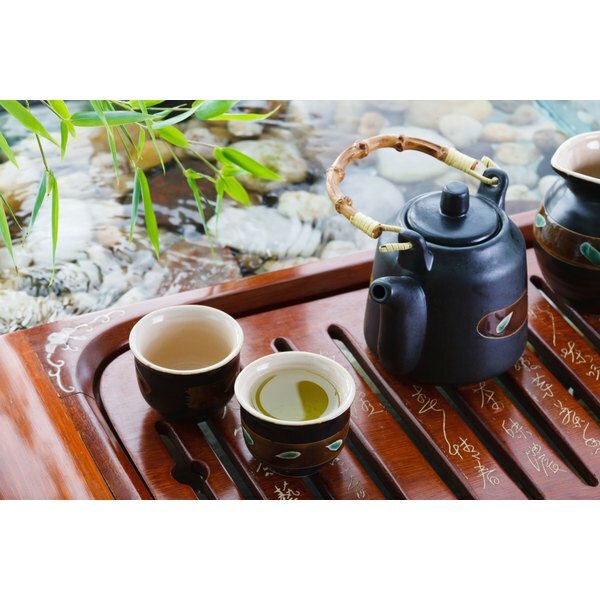 These teas often include the artificially created GanedenBC30, which can withstand the freezing or boiling process, making it a good candidate for those foods that require freezing or heating before they may be enjoyed. Probiotics can be found in many dairy-based food products, such as milk. These probiotics are found in both fermented and unfermented milk, according to the National Institutes of Health. However, most probiotics will not survive if they are added to boiling water. This means that adding milk with probiotics to your piping hot tea will cancel out any of the positive benefits that may have been available in the milk. There are a few important things to consider when starting to use a dietary supplement such as probiotics. First, any change to your dietary regimen or the addition of any type of supplement should first be discussed with a doctor. Second, according to the National Institutes of Health, there are no proven positive effects of probiotics. Many studies have showed limited positive effects, but more studies are needed to determine probiotics's full efficacy. Mayo Clinic: What Is Kombucha Tea? What Are the Health Benefits Of Kombucha Tea? : Brent A. Bauer, M.D. Andrew Fortier has been a writer since 2001. He has been published in "8clouds" literary magazine and in the "Writer's Slate" academic journal, as well as many small press newspapers and magazines. Fortier is pursuing a Bachelor of Arts in English at Metropolitan State College of Denver. How Do I Make a Chai Tea Latte Like Starbucks? Is the Good Bacteria in Activia Yogurt in All Yogurts?